ROBERT Louis Stevenson; John Buchan; Enid Blyton; Daniel Defoe; Jules Verne; William Golding; Arthur Ransome; CS Lewis: Jonathan Swift; RM Ballantyne. They had many things in common. But the link that draws this diverse scattering of authors into one archipelago is their love of islands, and their recognition that islands can be places of mystery, danger and adventure. What could stir the imagination of a walker more than a boat trip to an island and the chance to explore its hidden places? 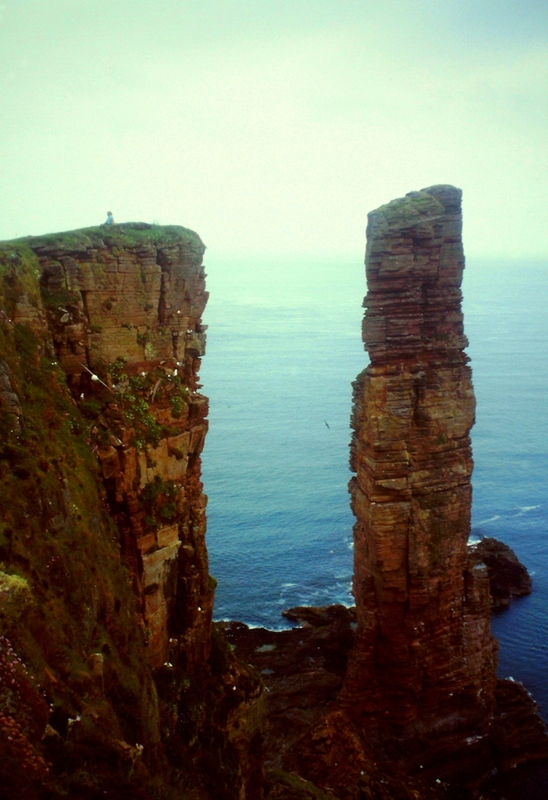 What could be more romantic than to navigate the legendary waters of Scapa Flow and disembark on the island of Hoy for a hike to its most famous feature . . . ? This is a retro post for Because They’re There. It’s a letter from the past featuring a memorable walk and the contemporary events surrounding it . . .
It’s June 2003. British boots march through Baghdad as Iraq lies in ruins and blazing oil wells pollute the environment. In another world a ferry carves a white road across blue crystal waters where the wrecks of previous wars lie entombed on the seabed. Seagulls scream as the island of Hoy approaches. Lighthouses guard these treacherous waters; lighthouses built by Alan Stevenson, uncle of the aforementioned Robert Louis. It’s another world, all right – but a small one. Hoy has been part of my life since childhood. Two events occurred in 1967 that implanted its image deep in my psyche – where it remains to this day. 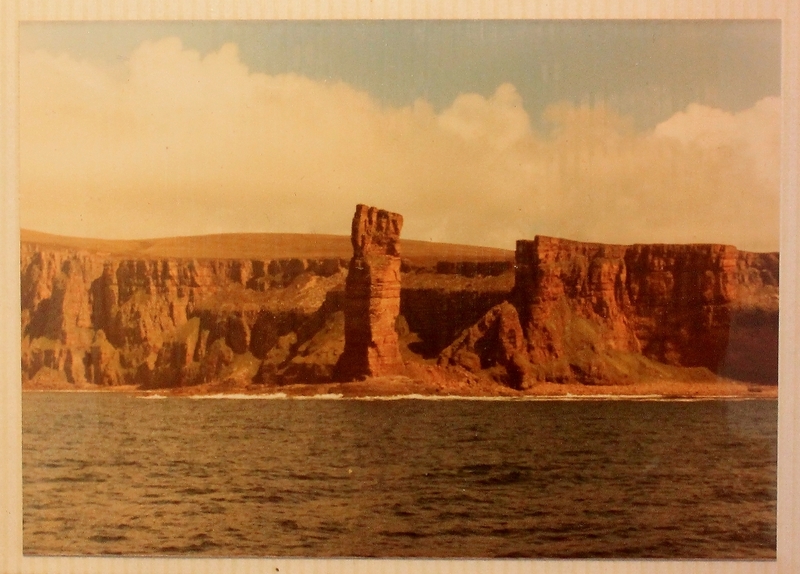 The first: Chris Bonington, Dougal Haston, Joe Brown, Tom Patey, Ian McNaught-Davis and Peter Crew climbed the Old Man of Hoy in a live BBC broadcast watched by nearly fifteen million people. It was compulsive viewing. It was in our house, anyway. 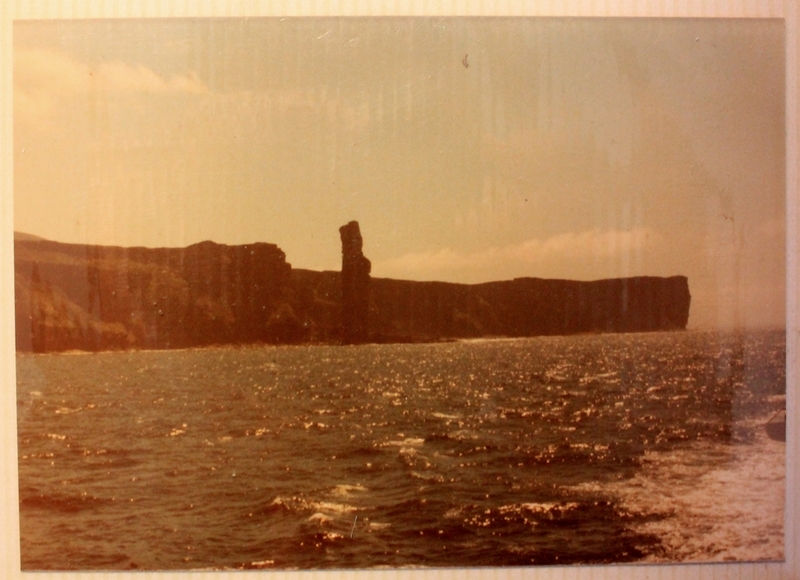 The second: A month later we sailed beneath the famous sea stack on the St Ola ferry, bound for a camping holiday on Mainland Orkney. The Old Man was wreathed in cloud that day, only his foot being visible between onslaughts from crashing Atlantic rollers. Between horrendous bouts of sea-sickness, my brother and I watched the black foot slip past as great waves pounded vertical cliffs. My father, seasoned by many years in the navy, hopped about in excitement as the sea crashed and the ship lurched, inadvertently highlighting the advantages of having half your stomach removed after abusing your body in the bars of Malta and Singapore and developing duodenal ulcers. The Admiralty takes duodenal ulcers extremely seriously. Anyone who has read Nicholas Monsarrat’s wartime novel The Cruel Sea, or watched the film, will know this. There was a third though less-memorable event. 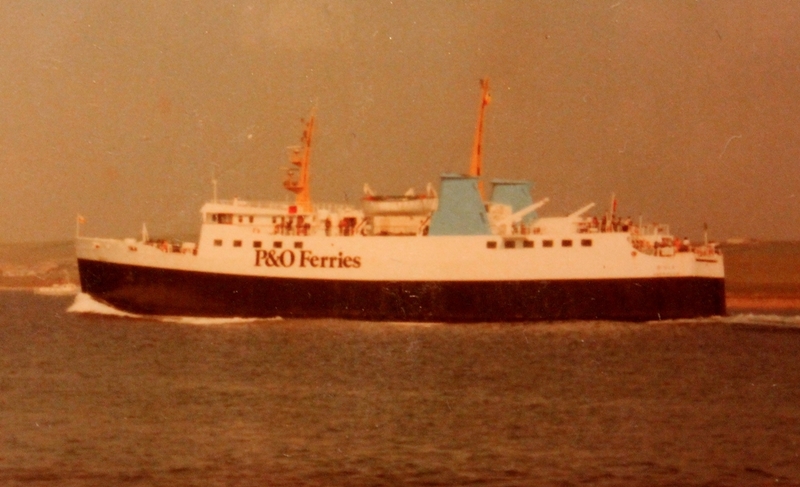 In 1977 I spent three months hitch-hiking around Scotland and the islands, and passed beneath the Old Man again, this time on a new St Ola (the third Orkney ferry of that name). The Old Man’s corporeal sandstone burned red and gold in the afternoon sun, transforming him into a friendly uncle from the angry stranger of ten years earlier. 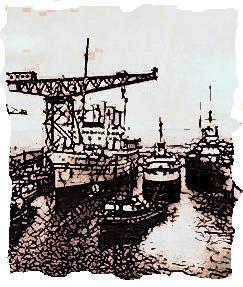 I intended to spend a few days on Hoy before progressing to the Shetlands, but this didn’t happen. 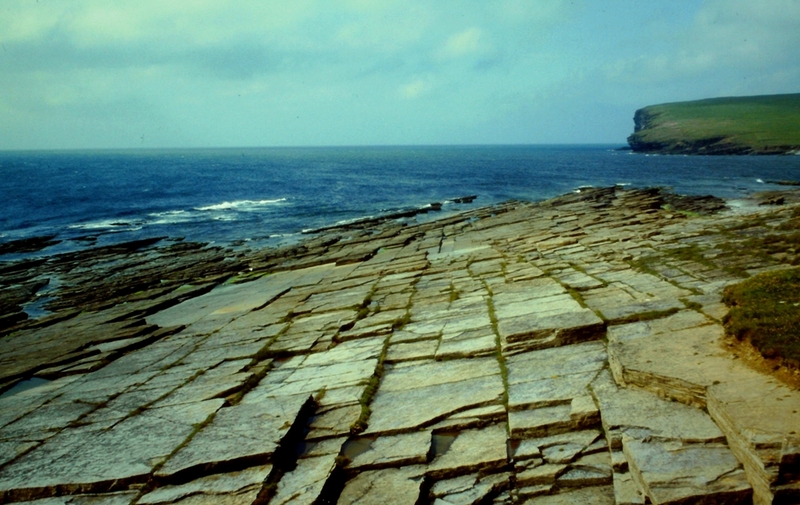 I tramped around Mainland for a week or so before hitching to the Outer Hebrides, leaving Hoy untouched. Unfinished business, perhaps. So it’s 2003 and this early-morning ferry bears my wife and me from Mainland towards a tiny quay on Hoy. Directly beneath our feet lie the remains of the German High Seas Fleet scuttled in 1919. A little to the east, and also unseen, lies the wreck of the Royal Oak, a British battleship torpedoed in 1939 with the loss of 833 lives. Fuel oil still leaks from its hull like blood from a dead knight. Such is the nature of war. We celebrate glory while the past contaminates the present. 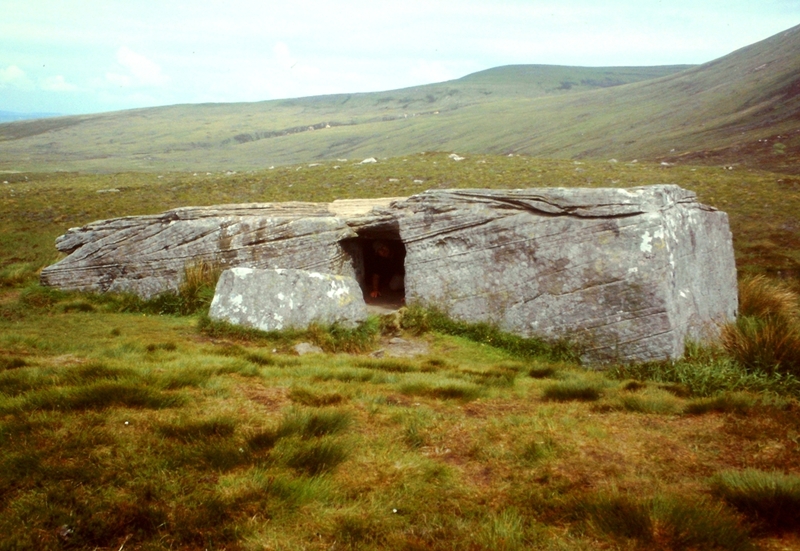 We drive north and west towards a group of buildings at Rackwick, interrupting our journey to visit the Dwarfie Stane, an impressive boulder of old red Devonian sandstone that was hollowed out during Neolithic times to form a tomb. A tomb with a room, but a tomb for whom? That’s a question that will never be answered. There’s not much at Rackwick: a couple of farmsteads and a lot of ruins; evidence that this place was once more populous than it is today. We pull on our boots and follow a path that slices up the flank of a green hill and walk into the west, peering from sea cliffs into the wide blue Atlantic ocean. This is a short walk. But it is unique and thrilling. Unique because it allows walkers of all abilities to access the immediate vicinity of one of Britain’s most famous natural features; thrilling because spacious green meadows suddenly, and almost unexpectedly, drop into a churning abyss where the Old Man of Hoy is revealed in his entirety. There he stands with his foot in the ocean – and the walker, being level with his head, can sit in the turf and look him in the eye. Here’s something interesting. 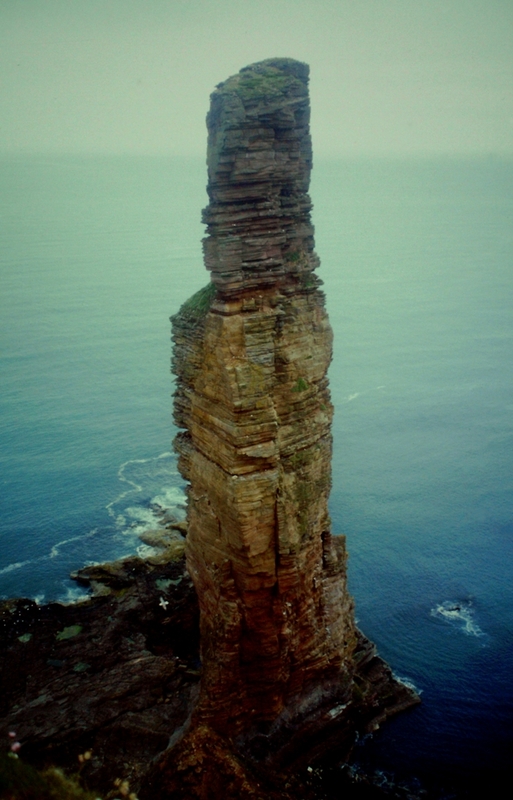 The Vikings wrote extensively about Orkney and Hoy in the Okneyinga Saga, but never mentioned the Old Man – because the sea stack did not exist during Viking times; it was incorporated into a promontory that has since disintegrated. 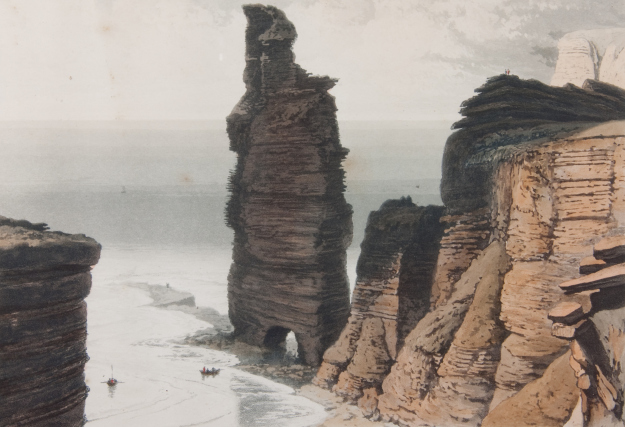 According to geologists, the stack came into existence less than 300 years ago when the surrounding cliffs collapsed, leaving not the one-legged man we see today, but the two-legged man depicted in a William Daniell painting (reproduced below) from the early 19th Century. Someday soon, his fate determined by a large crack in his shoulder, the Old Man will be an old man no longer. He will be a memory. Or perhaps we will rename him the Wee Man of Hoy. He will suffer the same fate as Marsden Arch, north of Sunderland, which collapsed into the sea in 1996. Here today, gone tomorrow. Geology usually marches at a trilobite’s pace, but on rare occasions it catches us out. Our earth is moving; it’s a living entity; new rocks turn into old rocks and old rocks become new rocks. Nothing has stopped. Don’t stand beneath the Old Man of Hoy to take a selfie. It might be your last. Thousands of years in the future, a geologist will find your flattened fossil in a band of new red Holocene sandstone. You’ll look good in Kirkwall museum, mind. We return through the clifftop wildflower meadows, accompanied by screaming gulls, our thoughts dwelling upon the magnificence of nature and the reality that the physical world is imperceptibly heaving and buckling and collapsing around us. Daunting thoughts, indeed. But I am left with one warming scrap of comfort. Whatever the fate of the Old Man of Hoy, I am honoured to have made his acquaintance and to have held him in the greatest of esteem. Since the age of ten he has been part of my life, and today I regard him as an old and valued friend. Just don’t expect me to stand on his foot to take a selfie. SINCE 2003 I have read several books about islands and island life. Three of the best are: The Lighthouse Stevensons (Bella Bathurst’s intriguing account of the family who built the majority of Scotland’s lighthouses); Attention All Shipping (Charlie Connelly’s humorous and extremely entertaining tour of Britain’s Shipping Forecast areas); Sea Room (the history and life of the Shiants, three small islands off the east coast of Harris, written by their owner, Adam Nicolson). I can recommend them all. But be warned. Once you have read them you will be tempted to sell your house and move to an outlandish place where there are no pies or internet connections. 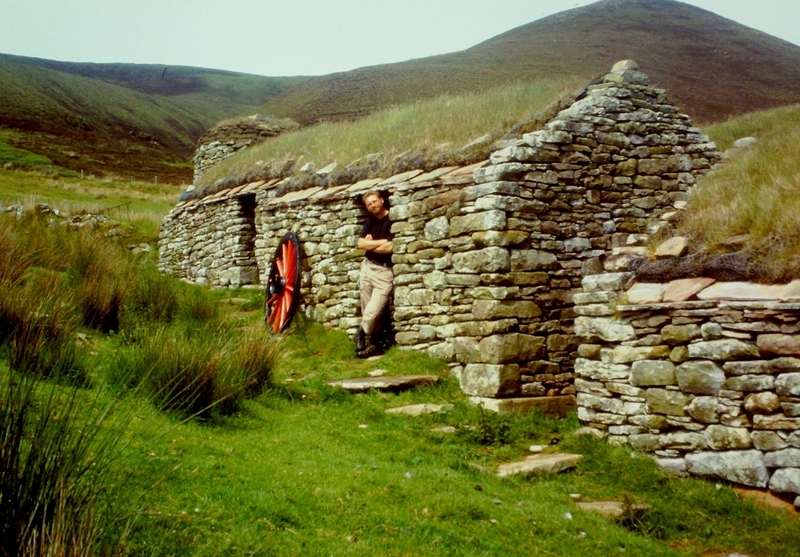 This entry was posted in Archaeology, Camping, Childhood, Climbing, Environment, Hiking, History, Ruins, Second World War, Shipping Forecast, Vikings, Walking, Weather and tagged outdoors, Scotland, transportation, Travel, WPLongform. Bookmark the permalink. Yes, I remember watching the TV climb. Great days. It was excellent. Television was made for stuff like that. But it doesn’t happen any more. I wish I’d got to see the TV spectacular of the climb – but we never had a TV when I was a kid. I love, repeat, love! rough seas! I can’t stand boring flat calms – rough sea trips are so much more exciting. The smaller the boat, the wider my grin! My experience of rough seas, Carol, is fine so long as I’m not in the middle of them. My last bad experience was on a very stormy overnight ferry trip from Ijmuiden to Newcastle. I managed to control things until we were off Scarborough when I heard the chap in the next cabin throwing up. It was downhill quickly from there. The Hoy TV climb was fantastic. I’m surprised the BBC hasn’t repeated it or turned it into a documentary. I wish they would repeat it – would be far better than the pap which poses as TV in Britain nowadays! Yes, we were all in front of the box for that one too. My mother had to watch from behind the sofa, pretty much, but even she couldn’t look away. Great stuff. It’s good to know other people have happy memories of the climb. Hope your mother recovered. I’m sure someone did a feature on the live coverage of the climb. I’ve got an image of that old line-strewn early tv footage with lots of scenes of the outside braodcast van and such like. It might have been a Countryfile feature or something similar. It surprises me what sort of things were broadcast live in the olden days. Soap operas cancelled for Ali v Foreman and Evel Kneval jumping the Grand Canyon (or jumping into the Grand Canyon as it turned out). ‘A tomb with a room, but a tomb for whom?’ You really do need to get started on writing that book. You’ve got so much material to use. Hi Chris. Yes, I do believe some of the soaps were broadcast live – Crossroads, for instance. Live television is far more interesting and entertaining than the stuff we get these days. You never know, one of the good things to come out of Brexit might be television as it used to be, with live broadcasts, black and white images, lines across the screen and buzzing noises, and Alvar Lidell reading the news. Actually, I’d settle for Reginald Bosanquet. You knew where you were with people like that. I keep fiddling with the book and changing bits. That sort of thing can go on for ever, I know, but one day soon I intend to let it loose on an unsuspecting world. A highly inspiring story, Alen. Brilliant told!! Did you know William Daniell’s painting in advance, or did you find it during your research for the story? Hi Hanna. No, I came across the painting when I was doing the research. I think it’s on the Hoy Wikipedia page. I will look at the Google path myself. It’s beautiful place for walking. Hej Hanna. Thanks for the video. The porridge looks good but I bet they get fed up of it after a few weeks. I have a translation of Orkneyinga Saga which I bought many years ago. I have read most of the sagas that have been translated and they are a valuable source of information. Some are also quite humorous in places. Hi Andy. I remember it being on the TV but I can’t say with my hand on my heart that I watched it. The old memory banks keep playing tricks on me. Just checked the internet to see if there’s any footage but I can’t find any. It took place in August 1984 apparently. It also features in the old Conrad Veidt wartime film The Spy in Black. I didn’t know that. It’s on Youtube. I’ll watch it later. Just watched it. Fantastic film. But I thought the U-boat captain was stretching things when he pushed his motorbike from the base of the Old Man of Hoy to the top of the cliffs. There is hope however: Sir Chris has repeated the climb at the age of 80, lots of puns about old men. You tube it. You have awoken my interest though I’m not sure about that crack widening. Hi John. Thanks for the info. I’ll look for that on Youtube. Meanwhile, just watch out for that crack and take your tin hat with you just in case.